Athens City Hall is located at 301 College Avenue, Athens, GA 30601; phone: 706-613-3010. Photo: City Hall, 301 College Avenue, Athens, GA, Richard Chambers, photographer, May, 2008, en.wikipedia.org, accessed February, 2011. 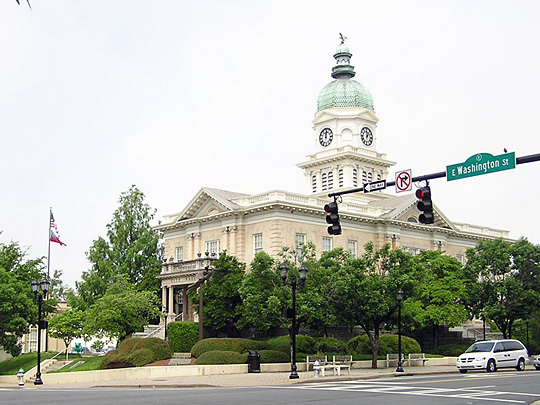 Known as Athens-Clarke, the Clark County and the City of Athens operate under a unified, consolidated government beginning in 1990. When the University of Georgia was incorporated in 1784, Georgia became the first State to support a state-chartered university. When Athens became a town in 1806 it was the most northern settlement in the State, and nearest to the borders of the Indian reservation. The first store was opened by Stevens Thomas, and the second by Elizur Newton. The descendants of these men long occupied prominent positions in Clarke County. The City of Athens was constituted a municipality in 1872 under a charter from the General Assembly. The city is built on ridges that rise up from the Oconee River, and from several small streams that lead into that river. 46 streets received their official names in 1859, including Lumpkin, Clayton, Hancock, Prince, Thomas, and Baldwin. Until that point, no street in Athens had an officially recognized name and many were entirely nameless. The social life of Athens in antebellum days had many marked peculiarities. The town had attracted, by virtue of its educational advantages (Franklin College, now the University of Georgia) a large number of wealthy and cultured people; the history of the State is dotted at very frequent intervals with the names of Athens men. The University commencements were occasions of most lavish hospitality, and scarcely a home could be found at such times that did not hold a distinguished guest. As there were no railroad facilities for many years, everybody came in private carriages; those from Savannah and the lower portion of the State making Athens their stopping place on the way to Madison Springs and the picturesque summer resorts around Clarkesville and Tallulah Falls. Those concerned with the affairs of State followed the Governor and Senatus Academicus to Athens and all were accorded a generous welcome. Many of the political slates in State and national politics were concocted at such times in the handsome drawing rooms that fringe the University campus. Before an audience of this description, made attractive by beauty as well as renown, the young recipients of college honors made their best bows and delivered their best speeches. Charles Morton Strahan, C.M.E., Clarke County, GA. and the City of Athens, Charles P. Byrd, Printer, Atlanta, 1893. Early Athens History, www.athensclarkecounty.com, accessed July, 2012. History of UGA, www.uga.edu, accessed July, 2012.